ALavandhAr says “Even if you give up on your vow which is highlighted in SrI rAmAyaNam ayOdhyA kANdam 18.30 ‘rAmO dhvir nAbhibhAshathE‘ (SrI rAma will not speak in two different ways), mercifully seeing my relationship with periya mudhaliyAr (SrIman nAthamunigaL) in context with acquiring knowledge and birth [being born as his grandson], and disregarding my own virtues and vices, you should accept me” and ISvara replies “Since there is no shortcoming in that approach, I oblige to do that” and bestows that boon to ALavandhAr. Being satisfied, ALavandhAr concludes the sthOthram [prabandham]. [Oh emperumAn!] Without considering my conduct, you should mercifully pardon me seeing nAthamunigaL who is the epitome of natural love towards your divine lotus feet, who is self realised and who is my grand father. akruthrima – “kriyayA nirvruththa: kruthrima:, thadhrahitha: akruthrima:, svAbhAvika ithyartha:” (kruthrima (artificial) means something which occurred due to another action; akruthrima means the opposite; that is, something which is natural [not an effect of another action]”. Since ALavandhAr belongs to yOgikulam (clan of those who are experts in yOga), this [love towards emperumAn’s divine feet] is in-born for him. Also explained as “true love towards emperumAn”. thvath – You who are the apt lord; your. charaNa aravindha – the enjoyable divine feet which are naturally approachable by devotees. prEma prakarsha avadhim – Ultimate state of great love for bhagavAn. Whatever attachment we have in worldly matters, he has that in bhagavAn, who is the natural/apt recipient [of our love]. 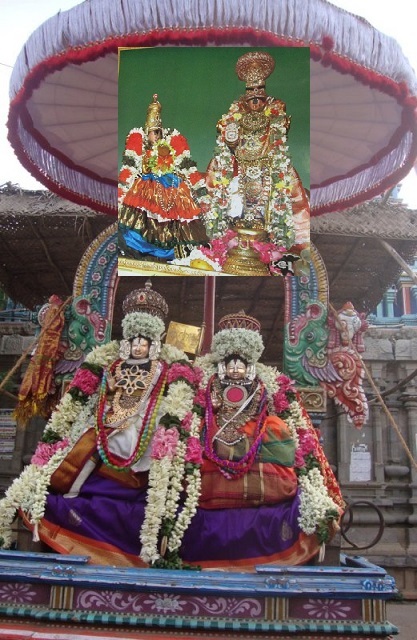 Athmavantham – As bhagavath SEshathvam (being a servitor of bhagavAn) is the svarUpam, nAthamunigaL is the one who has the knowledge about the ultimate nature of the self [which is being a servitor of bhagavAn’s devotees]. As said in “dhanavantham” (wealthy) [nAthamunigaL is very knowledgeable about the self]. pithAmaham nAthamunim – Having the physical relationship [as my grandfather], one who is the wealth of bhagavath gyAnam (knowledge about bhagavAn). vilOkya – mercifully seeing (glancing) him. prasIdha – Pardon my aparAdhams (faults/mistakes). math vruththam achinthayithvA – ALavandhAr saying “Please disregard my vices” [this is general explanation]. [specific explanation now] “math vruththam” (my conduct) indicates virtuous activities. When we say some one as vruththAvAn, that means we only talk about his good activities. ALavandhAr requests emperumAn to disregard his own good qualities, and requests him to consider his relationship with periya mudhaliyAr (nAthamunigaL) as the refuge and concludes the sthOthram. I worship yAmunAchAryar by whose mercy my defects have been removed and I have become an identifiable object, i.e., previously I was like asath (matter) and now I have realized that I am sath (soul) after meditating upon the lotus feet of yAmunAcharya. Thus ends the English translation for periyavAchchAn piLLai’s divine commentary for sthOthra rathnam. This entry was posted in Other, sthOthra rathnam on March 22, 2017 by Sarathy Thothathri.